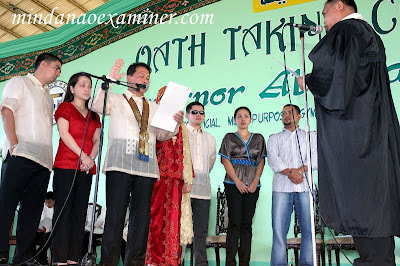 SULU, Philippines (Mindanao Examiner / July 1, 2010) – Reelected Sulu governor Sakur Tan formally took his oath during inauguration rites attended by thousands of supporters at the provincial capitol and vowed to support the new Aquino government. Tan, who was invited in the Wednesday inauguration of President-elect Benigno Simeon Aquino III, pledged his full support to the new administration. “To be among you, the people, is not a measure of loyalty or of patronage, but rather, the practical reality which recognizes the fact on where sovereignty truly resides,” Tan said in his speech. 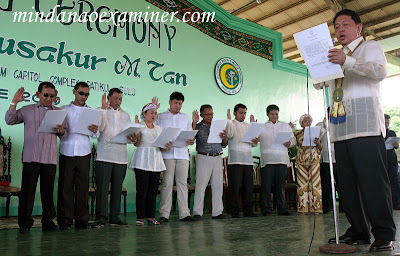 Tan, clad in a pair of slacks and Barong Tagalog, was accompanied by First Lady Hajja Nurunisah Tan, who was likewise beautifully dressed in traditional red gown, and the official family and his brothers and sisters. Top U.S. and Philippine military officials and various leaders of civil society groups and nongovernmental organizations were also present during Tan’s inauguration. Tan vowed to continue his peace and development programs and to hasten local economy by enhancing trade and investments not only in Mindanao, but neighboring countries such as Brunei, Indonesia and Malaysia, and in return provide livelihood and jobs to locals. The three Asian countries also make up the East Asia Growth Area, a sub-regional economic cooperation initiative in Southeast Asia that included the Philippines. “We are pursuing with vigor trade and other investments with our neighbor – Brunei, Malaysia and Indonesia – and hopefully forge sisterhood and trade agreements between these countries. We will also continue peace and development programs and other projects vital to the economy and progress of Sulu,” Tan told reporters. Tan called on citizens and his political opponents to work together for peace and progress of the province. “Election campaigns are always divisive as some electorates are emotionally attached to their candidates. The heat of the campaign has now subsided and I call on everyone to begin the season of healing, as I call on, even my political opponents to join in our efforts to effect the changes that Sulu desperately needs. This is the time when petty issues and narrow interests subsume to the higher interests and welfare of the majority of the majority of the people,” he said. Brigadier General Rustico Guerrero, commander of military forces in Sulu province, accompanied by his commanders and members of the U.S. Joint Special Operations Task Force Philippines, later met with Tan and discussed future humanitarian projects. “The Armed Forces of the Philippines and the U.S. Joint Special Operation Task Force Philippines are always working hand-in-hand with the provincial government and Governor Sakur Tan is very supportive of our peace and development programs,” Guerrero said. Filipino and American soldiers deployed in Sulu have been active in many humanitarian, development and infrastructure projects that benefited mostly poor Muslims in different areas in the province. Tan’s first order to the police and military is to strictly enforce the total gun ban in Sulu and stop the proliferation of illegal weapons in the province. 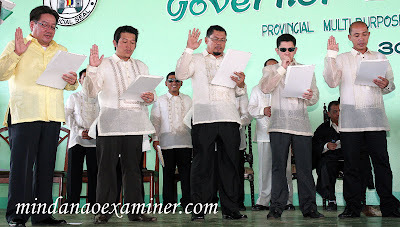 He also told authorities to curb illegal drugs in Sulu. “To curb violence, we will implement gun ban in the entire province. The proliferation of illegal drugs should be arrested before narcotics inflict irreparable damage to society. 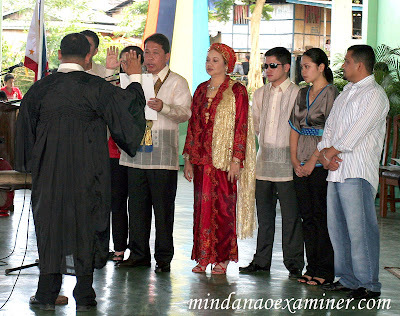 The law will give no quarters to drug-dealers and drug-users alike,” he said. In the end of his speech, Tan lauded the Armed Forces of the Philippines, the Philippine National Police and the Commission on Elections for the peaceful and successful automated elections in May, the first-ever in the country’s political history. He also praised the various civil society organizations and members of the Muslim and Christian religious communities for strengthening inter-faith relations between peoples of different faiths in Sulu, one of five provinces under the Muslim autonomous region. Tan then went on to thank Brother Eduardo Manalo, the Executive Minister of the influential Iglesia ni Cristo - the largest independent church in Asia - who endorsed his candidacy.